ELSS Funds (Equity Linked Saving Scheme) are one of the best and most popular tax saving options for the investors. ELSS investment serves two purpose (1) Tax saving (2) Wealth generation. If you are doing tax planning exercise, you must be looking for good ELSS fund for investment. Let’s take a quick look at ELSS benefits, features and try to analyze and identify the Best ELSS Tax saving Mutual funds for investment. ELSS is diversified equity mutual funds available for tax saving purpose. ELSS invest a majority of a corpus in the Equity market. ELSS funds have both dividend and growth options. This type of fund has a lock-in period of 3 years from the date of purchase. You can start SIP (Systematic Investment Planning) in ELSS with a minimum investment of 500 Rs. 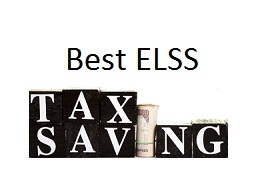 Why ELSS is best as Tax saving Instrument? Tax Deduction of 1.5 Lakh can be claimed under Section 80 C of Income tax by investing in ELSS. ELSS comes with Lock in a period of 3 years. This lock-in period is lowest compare to other tax saving options like tax saving fixed deposit and PPF. PPF investments are locked for 15 years, Tax-saving fixed deposit is locked for 5 years compare to that ELSS has a lock in period of 3 years only. Expected return in ELSS is higher compare to other tax saving instruments PPF or Tax Saving FD. ELSS funds fall under the EEE (exempt-exempt-exempt) category same as that of PPF and Sukanya Samriddhi Account. Under this funds investment amount get a tax deduction, withdrawal amount is tax-free and no tax will be charged for capital gain also. Dividend obtained from ELSS funds are also tax-free. ELSS fund also offers SIP investment option, which brings discipline in regular investing. From above you can clearly say that ELSS fund is best tax saving option. After understanding the features and benefits of this fund let us take a look at best ELSS fund for the investment. SIP Investment mode is advisable over lump sum to take advantage of cost averaging. Select Growth option over dividend for wealth generation. It is good idea to invest in Direct Plan to save cost and generate higher returns. Its good idea to stay invested in ELSS beyond lock in period of 3 years for long-term wealth creation. Along with ELSS fund, you should also invest your money in other equity mutual funds. Maximum ELSS advisable per portfolio is 2 or 3. Do you invest in ELSS Mutual funds for tax saving? Do you think ELSS fund mentioned above are best for investment? I have 6L Rs . Want regular monthly income . If you want regular monthly income you can plan to invest in monthly income scheme or fixed deposit. These schemes are low risk low return.